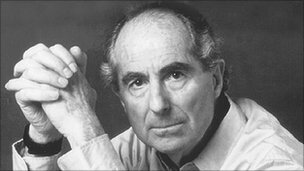 US writer Philip Roth has been announced as the winner of the fourth Man Booker International Prize. The award and £60,000 prize money is presented to a writer for their “achievement in fiction on the world stage”, organisers said. His body of work includes the 1997 novel American Pastoral, for which he received the Pulitzer Prize. At 26, he wrote his first book Goodbye, Columbus. The announcement was made at a press conference in Australia, during the Sydney Writers’ Festival. The award will be presented at a formal dinner in London on 28 June, however a spokeswoman said Roth would be unable to attend. Born in Newark, New Jersey in 1933, Roth’s controversial 1969 novel Portnoy’s Complaint brought him worldwide attention for its graphic depiction of sexuality. Time magazine included the work in a list of the best novels of the 20th century. His 2000 book The Human Stain was adapted for the screen, starring Sir Anthony Hopkins and Oscar-winner Nicole Kidman. The American author said he was grateful to the judges for awarding him the “esteemed prize”. He added: “One of the particular pleasures I’ve had as a writer is to have my work read internationally despite all the heartaches of translation that that entails. The judging panel was chaired by writer, academic and rare-book dealer Dr Rick Gekoski. “For more than 50 years Philip Roth’s books have stimulated, provoked and amused an enormous, and still expanding, audience,” he said. Gekoski was joined on the panel by writer and critic Carmen Callil and award-winning novelist Justin Cartwright. In March British thriller writer John Le Carre asked judges to withdraw his name from the shortlist. His Dark Materials author Philip Pullman and Rohinton Mistry had also been up for the award. The Man Booker International Prize, which is presented every two years, has previously been awarded to Ismail Kadare in 2005, Chinua Achebe in 2007 and Alice Munro in 2009. This entry was posted in LITERATURE and tagged BBC News, literature, Man Booker, Man Booker International Prize, Philip Roth by mabokov. Bookmark the permalink.